I recently tried installing rEFInd on Yosemite using the command ./install.sh --alldrivers however it would not recognise the ubuntu 14.04 x64 for Mac disk I made and so I would like to uninstall rEFInd. I have tried removing rEFInd from the EFI directory, however the EFI directory does not exist. How do I uninstall rEFInd 0.8-3.7 using OS X 10.10.3? Note: El Capitan (OS X 10.11) prevents users from selecting rEFInd and common Linux distributions from the Startup Disk pane. The new preferred method is to install rEFInd into the an EFI partition. My answer, to an unrelated question, outlines this new preferred method to start the rEFInd Boot Manager and Linux operating systems. The answer, given below, applies to Yosemite (OS X 10.10) and possibly earlier versions of OS X. Personally, I installed rEFInd on my computer to its own partition. This prevents the problems you are encountering. Everything ./install.sh installed went to this partition. If I want to remove rEFInd, I can simply erase or remove the partition. Of course both are unnecessary, because I can turn rEFInd on and off at will. 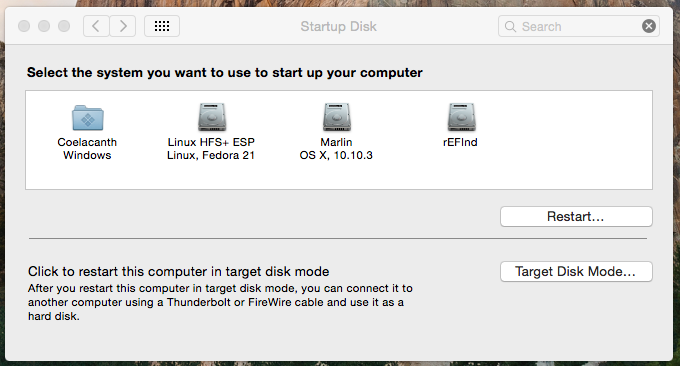 I just go to the Startup window in System Preferences select my boot partition. This computer has OS X, Windows, Fedora and rEFInd installed. Note, the rEFInd partition is ~ 1 GB in size. In fact, it can be as small as 100 MB. When I setup this computer, I used the Disk Utility application to create the rEFInd partition. If I would have used the gpt command, I could have created a smaller partition. Neither OS X, Windows, Fedora nor rEFInd use the EFI partition to boot the computer. In fact, there is nothing useful in the EFI partition. How do I uninstall rEFInd 0.8-3.7 using OS X 10.10.3? Read the ./install.sh file and undo whatever it did. I should of had you run the commands bless --info and bless --info --getBoot. These would have told where the .efi file was stored. Note: Almost everyone installs rEFInd to the OS X boot partition. How would I go and reinstall it using different options if I cannot remove it? The author of the software never said rEFInd could not be removed. I suggested you just install it again to its own partition. This might be a good place to mention the gpt command has to be run while either booted to an external recover partition or while booted to internet recovery. Could I simply remove the EFI partition or would that corrupt my Mac? Do not remove the EFI partition! It is not used to boot OS X, but it is used by OS X for other things. Not the answer you're looking for? Browse other questions tagged macos boot uninstall dual-boot refind .